More and more people are coming to Facebook to watch and share videos. Recently released statistics from the social network demonstrate just how prolific video consumption is on the platform. According to Facebook CEO Mark Zuckerberg, 500 million people watch videos on Facebook daily, accounting for 100 million hours of viewership. Since video has such a captivated and engaged audience, brands are dedicating a large amount of time and resources towards incorporating the medium into their social content strategy. Today, we’re excited to introduce Facebook video publishing in Sprout Social. This recent update is designed to help brands enhance their Facebook content strategy by sharing rich and engaging videos from Sprout’s Compose window. 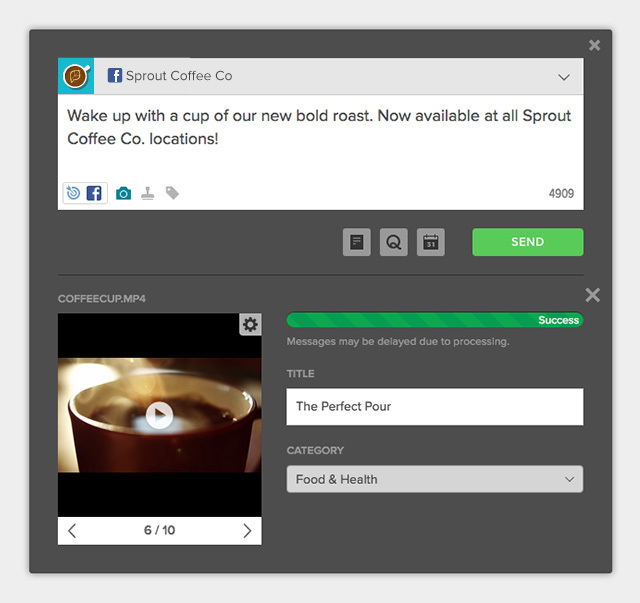 Sprout users in all plans can draft, schedule, queue and publish native Facebook videos to their Facebook Pages from Compose. In addition, Sprout’s Facebook video publishing capability works seamlessly with existing, more sophisticated publishing tools like content/campaign tagging, message approval workflow and comprehensive Facebook targeting options. To upload and schedule or publish a native Facebook video, start by opening the Compose window. After selecting the Facebook Page(s) to which you’d like to publish your video, click the camera icon in the lower left corner of the Compose box. Upon selecting the video file (.mp4, .mov or .avi) from your computer, the video will automatically begin to upload to Compose. While it’s uploading, you can give your video a title, select a category, compose your message and apply any targeting, tags or approval workflow as necessary. 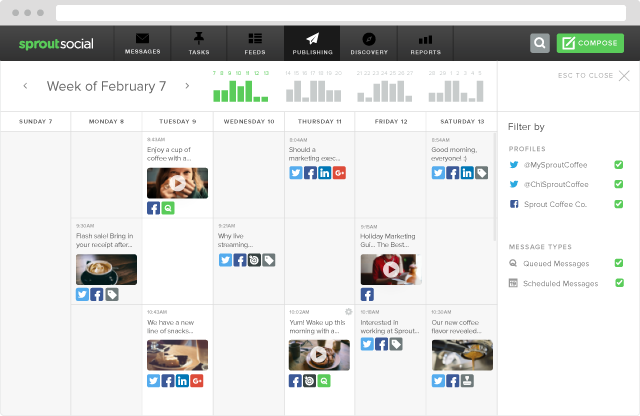 Your upcoming Facebook video posts are visible in Sprout’s publishing calendar as well as in the Scheduled and Sprout Queue sections within the Publishing tab. In addition, creating drafts and submitting messages for approval make collaborating on your Facebook video posts efficient and effective. Published Facebook video posts will appear in your Sent Messages report allowing you to analyze and measure the performance of your video content. You can track all the same message-level metrics that are available for other Facebook post types in Sprout including: reactions, comments, shares, engagement and more. We know that video has become an increasingly important part of a business’ Facebook content strategy. Sprout’s Facebook publishing tools, now with support for native Facebook video publishing, are designed to help you manage and deliver engaging multimedia content to your audiences. Stay tuned for more updates to Sprout’s publishing tools. And as always, feel free to share your feedback.